The kind people over at ecigerette direct contacted us and asked if we'd like to review their products. We were given £100 to spend on their site as we wish. I purchased myself a new box mod and 4 liquids which I will go through separately. Firstly I'd like to say how good the website layout is and how easy it was to navigate through. To purchase from this site you will need to create an account with ecigerette direct, the bonus is this will also give you enough point to get £5 free credit. I purchased a coolfire IV TC100 priced at £59.99 then a selection of 4 liquids, Skye 7 13 sins priced at £12.80, ZAP purple slushie at £7.99, FAR E-liquid Melon ball at £7.99 and ZAP melonade also priced at 7.99. The last 2 liquid reviews will be guest wrote by a friend and fellow vaper, Reef Mellors. The order was despatched to me as quick as possible, the company will attempt wherever possible to despatch the order within 24hours when you order during the week and despatched the same day if ordered before 3pm Further to this on any order over £20 free delivery is included within the service to any mainland U.K. Address. So how did I find the products I purchased? I used this as an opportunity to get a new box mod, I read the specifications of this box and was really impressed, the box can run at 100w which when you take the price into consideration is extremely good value for money. It allows for a variety of different vaping methods from temperature control to wattage control and it also can take into account if you coil is nickel titanium or stainless steel. This again is something that you can only really get in the higher end of the price bracket. The box mod is available in a range of colours. I chose blue but you can get it in black, red or white if blue isn't your preference. The box is extremely easy to use, a simple display and just 3 buttons, the power button and then a + and - button to increase and decrease the temperature or wattage and select the coil type. The initial set up was simple, I attached my tank to the mod and simply started vaping. The box allows for 0.2 second fire to vape time which is extremely fast and is head and shoulder above any other mod in this price range. 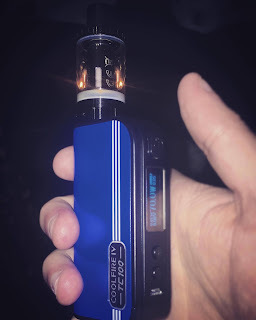 The battery life is outstanding, in my old set up the Wismec RX75 I had to charge it at least 3 time a day running at 50w however in the coolfire I was running at around 70w and only needed to charge this once maybe twice a day. This would make a great kit for an experienced vape user who would like to experiment at higher watts or start using temp control. Alternatively this could also be great for someone starting up vaping, it's simplistic usage makes the experience seem easy, everything on screen is clear a simple. What first attracted me to this liquid was the images on the bottle, it stood out in a strange way. Then I read the description of "A delicate fusion of ripe forest fruits and lush vanilla cream, rounded off with a refreshing juicy splash of honey dew melon" and decided there and then that I wanted to try it. I'm a big lover of fruit based flavour and this one did not disappoint, although there is a big combination of flavours in this liquid they all combine really well create a smooth clean vape. The taste that came through the most for me was the Forrest fruits, the honey dew melon didn't seem overly present however this could have been due to my coil slowly dying. I would highly recommend this liquid however as a must for any fruit flavour loving vaper. What can I say about this liquid other than, it is what it says on the tin. Now I had a blue slushie flavour from another brand a few months ago and I loved it so I thought it will try the purple slushie. The thing I love about slushie liquids is the nostalgia of it all, the memories of nagging for a slush puppy when you were a kid. This liquid had that nostalgia feeling, the inhale was cold and refreshing, a similar feel to when liquids have a menthol based element. On the exhale you have a fruity burst of grapes which was much more prominent than I had anticipated. The bottle design was extremely eye catching a neon purple with black writing, this made it stand out amongst the other. This would be an ideal liquid someone who enjoys the nostalgic vape flavour or those who prefer menthol. This is a combination of the classic honeydew melon with a refreshing lemonade to create quite a unique, flavourful liquid. It comes in a striking green bottle. This liquid is a great twist on the usual melon flavours out there and is a solid addition to any collection. Not quite an all day vape, the intense flavours can become a bit much after a few hours of solid vaping, however, the unique melon/citrusy blend will keep you coming back for more. Would definitely recommend to anyone who likes their melon or fruity/citrus style flavours and is looking for a unique tang or new liquid to add to their collection. Melon ball from FAR Eliquids is the opposite side of the melon-spectrum to melonade. This Eliquid tastes like an extremely sweet, almost sugary honeydew melon. Bringing you a smooth and sweet easy-vape. It isn't an overwhelming taste, but a safe choice to mix up your usual palate with melony-goodness. I would recommend to anyone looking for a new liquid to try of the sweet tasting variety. All these liquids range from 70/30 pg/vg split and higher. 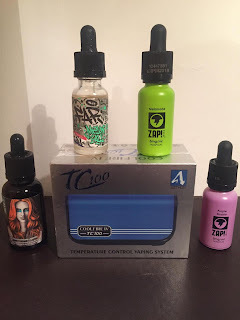 I would strongly urge anyone who is looking to purchase any of these liquids to ensure you coil can withstand slightly thicker liquids. Overall I would highly rate this company. They've wide brand of e-liquids and box mods are ideal for a novice or advanced vaper. Further to this they sell tanks and coils to fully accommodate your vaping needs. A big thank you to the guy at ecigerette direct for the opportunity and I will defiantly be purchasing from them in the future. These products were sent to me for free for the purpose of a review. This has had no bearing on the review and has in no way influenced my opinion of the product.